Demonstrations across many cities in Amhara region of Ethiopia defend identity questions in Wolkait and Raya and demand government to respond to it in accordance to the constitution. They also demanded the federal government to protect historical and natural heritages in the region. Residents of more than ten cities in Amhara region of Ethiopia (in central, Western and North Western parts of the country) took to the street today to protest repression against identity questions in Wolkait and Raya regions in north western and north central parts of Ethiopia. 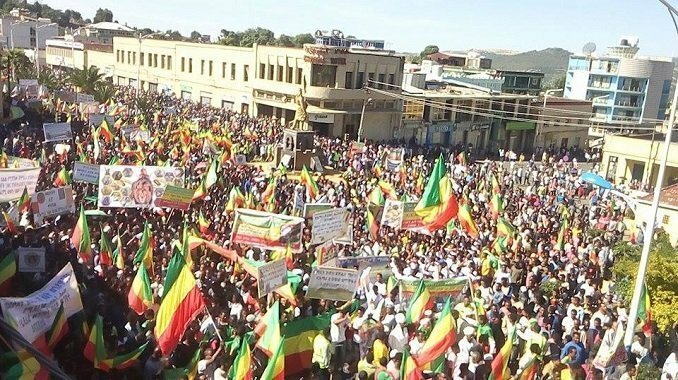 Bahir Dar, Debre Birhan, Debre Tabor, Dessie, Gonder, Sekota and Woldia are among the towns where tens of tends of thousands of people marched today to demand justice to residents of the above-mentioned regions. Nigussu Tilahun, Amhara Regional State Communication head, confirmed in a facebook update earlier today that the demonstrations were entirely peaceful and completed without any reports of security incidents. The protests seem to be a response to Tigray Regional state’s forceful measures against people in Raya, which used to be within the province of Wollo until TPLF pulled it towards Tigray under the guise of “new Federal regions arrangement” which was meant to be on the basis of ethnicity and language, who demanded that they need their identity be respected and condemned imposition of Tigray identity on them. Wolkait is another region which was included to Tigray in the same when TPLF took power in 1991. The movements in these regions have been simmering underneath for nearly three decades now. 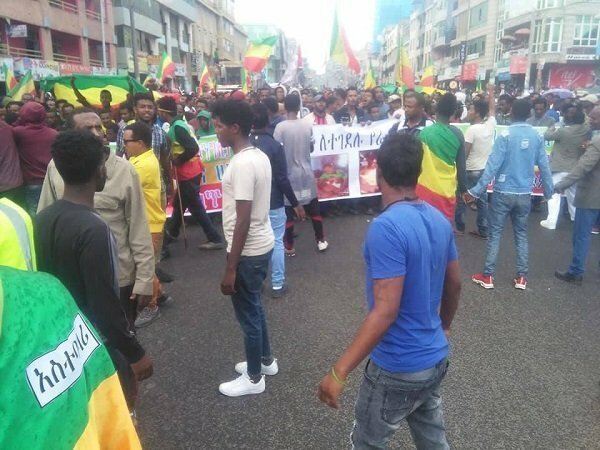 “Give Wolkait People’s Identity Question a Constitutional answer,” “Give Raya People’s Identity Question a Constitutional answer,” are among the slogans that protesters chanted today, according to a report by Amhara Mass Media Agency (AMMA). Tigray regional state security killed at least five residents of Alamata, a town in Raya region in north central Ethiopia, last week when they fired at protestors who demanded that their identity is not Tigrean and they do not want to be under Tigray regional state. Protesters also condemned the killings in Afar region of Ethiopia by the regional government which is allegedly still in control by TPLF leaders. Prime Minister Abiy Ahmed held a meeting yesterday with his deputy, Demeke Mekonen and the minister for peace, Muferiat Kamil, among others, regarding the identity questions in both regions. Abiy Ahmed wants the identity questions to be peaceful, which they are so far, and he also wants the response to them to be peaceful and legal, as reported by state media Ethiopian Broadcasting Corporation (EBC). Apart from political demands, protesters also demanded today the Federal government to act responsibly and in a timely fashion to rescue world renowned heritage of The Rock Hewn Churches of Lalibela which is in danger of crumbling. The prime minister and his deputy along with regional authorities visited the conditions of the church this afternoon. “A world heritage as wonderful as Lalibela and our pride, we can not build one like it, but it is our obligation that we have to preserve it,” Prime Minister Abiy Ahmed told the crowed in Lalibela. Water Hyacinth over lake Tana, source of the longest river in the world- Nile, is another challenge that protesters brought to the attention of the Federal government. Efforts have been underway since at least last year to rescue the lake, but the water weed is still threatening the existence of the lake. The prime minister has visited the lake and he pledged that the Federal government will help the effort to remove Water Hyacinth, as reported by AMMA.